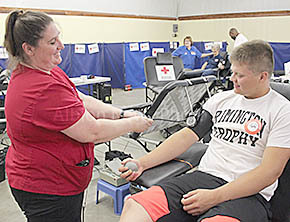 Albion hosted a visit of the Red Cross Bloodmobile on Monday, July 20, with a large number of donors. Among the donors, above, was Tate Zwiebel. Reaching gallon plateaus were Steve Von Bonn of Albion, 16 gallons, and Keith Carter of St. Edward, 14 gallons.